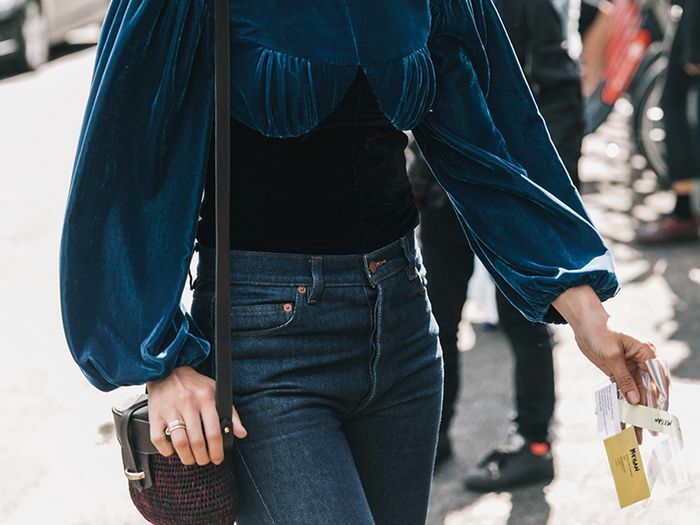 Jeans are probably one of the wardrobe staples that get the most use. They’re the ultimate pieces to wear for the weekend, a date night and even the office. But with all that use, what is the best way to take care of them. Really, it comes down to knowing how to wash right. While there are lots of tricks you can follow to make sure you’re taking care of your denim, it turns out the biggest mistake you can make is to stick them in the dryer at high heat. Not only does this shrink denim, but it can also distort the shape of your jeans. If you’re interested in finding out how to wash jeans the right way, we’re breaking down our top tips ahead. It is recommended to wash your jeans about every five to 10 wears. If you are worried about washing your jeans too often and fear they might be fading, soak them in cold water and vinegar for an hour, and hang them to dry instead. If you opt for the washing machine, turn your jeans inside out to protect against fading and also to ensure the dirtiest part of the jeans get clean. Jeans can be hand-washed using cold water and a little bit of detergent. Soak the jeans for about 15 to 30 minutes and rinse. To make sure the jeans are fully cleaned, try repeating this process two to three times. When drying jeans after hand-washing, don’t wring them. Instead, roll them up and press on them to get the water out, and then lay them flat or hang them up to dry. When using the washing machine to dry your jeans, make sure to use a medium to low heat setting. Go on to shop our favourite jeans to buy this season. A classic pair of khaki jeans will completely transform your weekend wardrobe. The pearl detailing on this pair is so sleek. Wear with a silky blouse for an easy day-to-night look. The stripe and frayed hem on this pair are everything we want from denim right now. We love the high waist on this super-flattering straight leg. The ultimate “mom” jeans, this faded side stripe will prove to be flattering. Wear with ankle boots and a chunky knit. The perfect pair of cropped flares. We love the new tomboy look. Style as shown with a slight gap between your boots. In case you didn’t know, we’re huge fans of this high-street denim store. Tiny crystals make these the perfect jeans for drinks with the girls. The front seam on these jeans is more flattering than you’ll realise. We love the stitching on this high-street pair. No one will know these are high street. The colour of this denim is spot on when you’re not ready for a monochrome winter wardrobe. A pair of classic black flares will never go out of fashion. Dress up or down with heels for work and trainers for the weekend. Now you’ve got new season denim sorted, you’ll be needing a pair of swanky ankle boots to go with them. Why not take a peek at our edit that’s up next?